The Marcel Breuer-designed Atlanta Fulton County Central Library serves as the central headquarters of a combined city-county library system, occupying an entire urban block within downtown Atlanta. The reinforced concrete building displays a degree of structural sophistication and innovation common to work throughout Breuer’s career. Both the scale and flexibility of the building layout are attributed to a steel structural system which provides the 30’ by 45’ primary column bays. It is notable not only as one of the most significant projects of architect Marcel Breuer’s late career, but also as an evolution in his twenty-year exploration of the library building typology, during which he produced designs for six library projects. The commission for the building arguably began with the strained conditions of Atlanta’s library system in the 1960s. As with many US metropolitan areas, rapid population growth following WWII surpassed the capacity and function of municipal services which remained largely unimproved since before the 1940s. In January 1968, Carlton Rochell assumed the post of Atlanta Library Director. Rochell, a native of Tennessee, became a leader in the advancement of library systems across the American South. Prior to Atlanta, he served 5 years in Anniston, Alabama where he successfully merged and desegregated the city and county systems. Rochell’s hiring had followed a 1964 assessment of the Atlanta system by Joseph Wheeler, an authority on public library operations. Wheeler had identified many deficiencies in services as compared to similar municipalities. Rochell carried these findings further and suggested an inventory gap of approximately half a million volumes and advocated for establishing both a children’s program and an audio/visual collection. Momentum gained for an update to the Atlanta library system and modernization of the central repository. In anticipation of expansion, the Library Board successfully purchased the remaining parcels on the city block with the intent to increase the present facility from 80,000SF to 200,000 SF. Records suggest that Rochell was attuned to the discourse of modern architecture in the 1960s. Through his leadership the Library Board solicited the interest of multiple architects in New York, including Paul Rudolph, but ultimately selected Breuer in 1969. The commission was to plan and design an entirely new building for 1,000 users and 1 million volumes, based on an ambitious 275-page program. It should be noted that this was not Breuer’s first contact with the city of Atlanta. 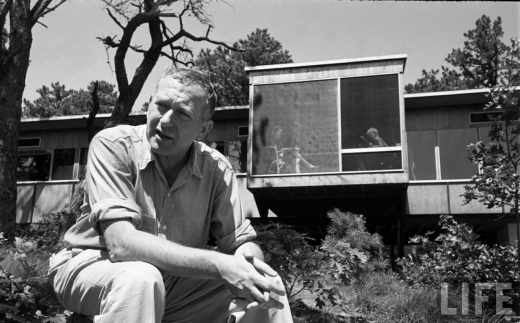 In 1946, shortly after his emigration to the United States from Germany, Breuer was a participant in a design competition for a “Realistic House in Georgia” sponsored by Rich’s Department Store and the magazine “Progressive Architecture”. Seven years later, he visited the city as a keynote speaker for a modern design lecture series, created by the Atlanta Vassar Club and honoring his design of the college’s Ferry House dormitory. Despite the 1969 selection did not advance due to local indecision on whether the new facility should be constructed at the current library site or a new site. At some point later in 1970, Breuer’s office was apparently released to prepare a schematic design for redevelopment of the existing library site. The submission, made March 1971, established the fundamental concepts for the library as ultimately built. The proposal accompanied an estimate of $15.2 million and a 2 – ½ year construction duration. The Library Board quickly presented the design concept to the public and it was warmly reviewed by popular columnist Celestine Sibley in an Atlanta Journal Constitution Magazine article the following month. Later in 1971, Atlanta businessman and philanthropist Robert Woodruff donated to the city a 75,000 SF parcel of properties he had purchased on Peachtree Street between Auburn and Edgewood Avenues. This prospect lead to a requested submission for an alternative schematic design (referred to as the Five Points site) and submitted by Breuer’s office (in collaboration with local architects Stevens & Wilkinson) in December 1971. The course of official decisions that followed submission of the two proposals is currently unknown, but the project effectively stalled. The Woodruff land donation did proceed to be developed as Central City Park (current day Woodruff Park), opening in 1973. A significant project delay was also due to a dispute between the autonomous Library Board and city government over the bond referendum. Although a public vote was initially scheduled for the spring of 1972, successful passage for the $18.9 million library improvement bond was delayed until 1975. Breuer’s contract for construction design services lingered through the city’s procurement process until May of 1976. Breuer’s design development submission was ultimately submitted in July. Breuer had initially undertaken the project in collaboration with design partner Hamilton Smith. 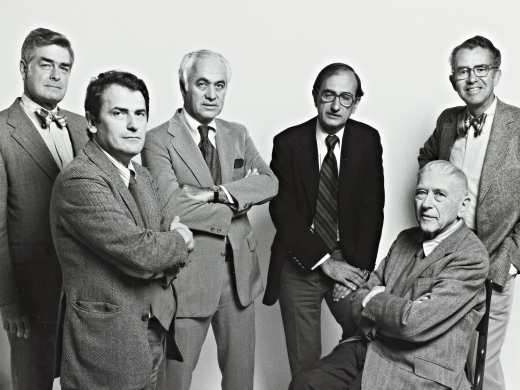 Smith was one of Breuer’s first partners, having gained the position in 1964 during his leadership of the Whitney Museum project. The timing of the Atlanta project delays coincided with Breuer’s declining health and substantial retirement from practice in 1976. Although Breuer was kept abreast of all his ongoing projects, Smith’s responsibility in executing the Atlanta library design concept cannot be underestimated. Although Atlanta-based Stevens and Wilkinson took responsibility for the construction documents, Breuer’s office remained closely involved in the development of project details, most notably leading the design for the custom pre-cast concrete façade panels. Following commence of construction, members of Breuer’s office made routine visits to Atlanta to monitor the activity and progress on site. Due to his health, Breuer was unable to attend the building’s dedication ceremony on May 25, 1980, and he died a year later on July 1, 1981 at the age of 81. 1990: Installation of "Wisdom Bridge" sculpture (Richard Hunt, artist) at entrance plaza. mid-1990s: Closure of indoor cafe and outdoor seating terrace (entrance on Carnegie Way). dates-unknown: Closures of ground floor gift shop (designed by Breuer's Office), "Children's Entrance" on Williams Street, and drive-through book service. 2002: Interior renovation, installation of new carpet and paint finishes, repairs to entrance plaza waterproofing, repair of water damage to sub-grade auditorium, modification of entrance plaza grading and handrails for ADA access. In 1982, Georgia passed a constitutional amendment that allowed the city to transfer control of the system to the county, and in 1983 the system was turned over to county control. To reflect the change in control the system was renamed the Atlanta–Fulton Public Library System.